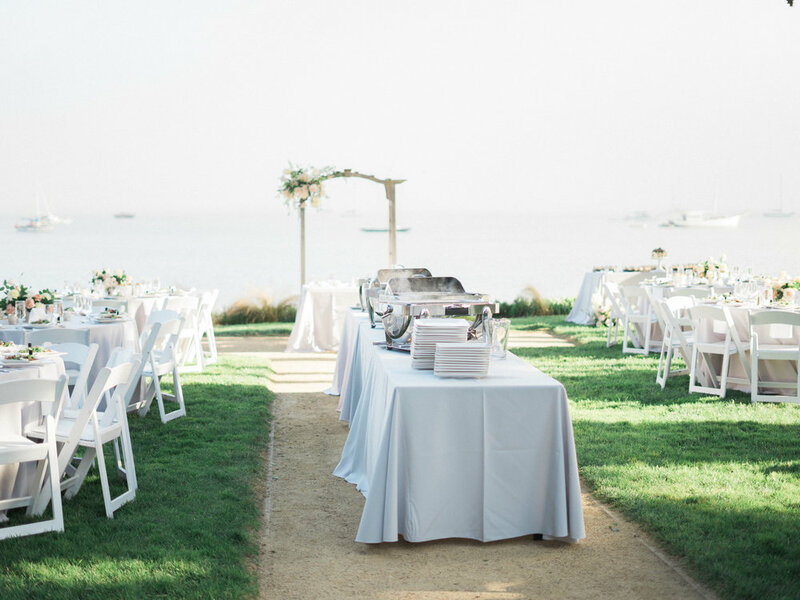 A little secret garden for you to get married on, surrounded by a few large trees and next to the overview of the gorgeous Half Moon Bay! Jessica and Aaron were a vision and so in love as they strolled around for their portraits at the Maverick's Event Center! Outdoor space, patio area and an indoor dance area for night time. 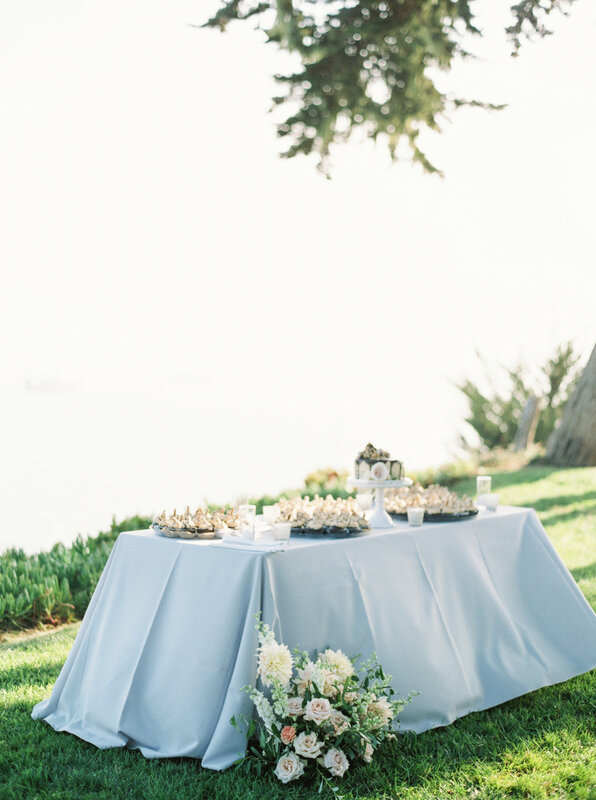 A bride can have it all in one place! Also just look at these gorgeous images - that's the perks of having an outdoor wedding, although it may be windy, if you have a great film photographer - they love all the natural light! 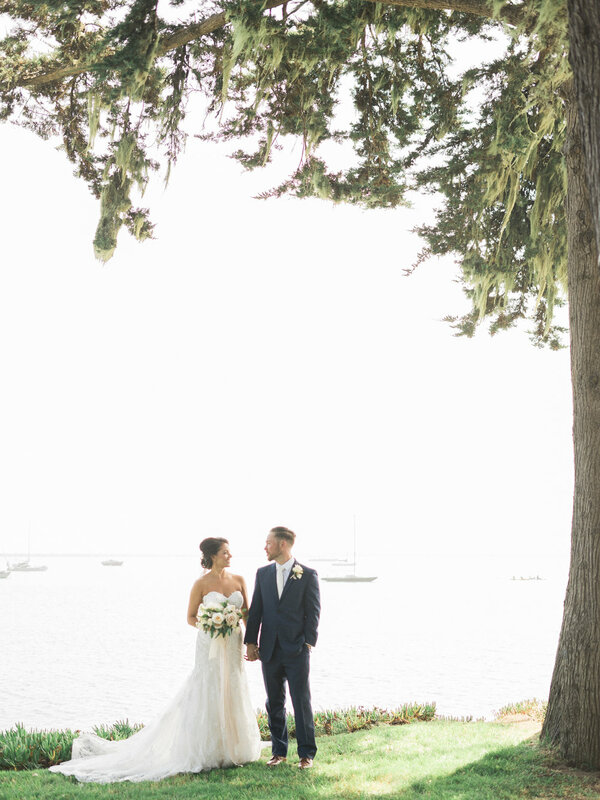 Jessica and Aaron wanted a classic blush filled wedding with accents of greens and browns. 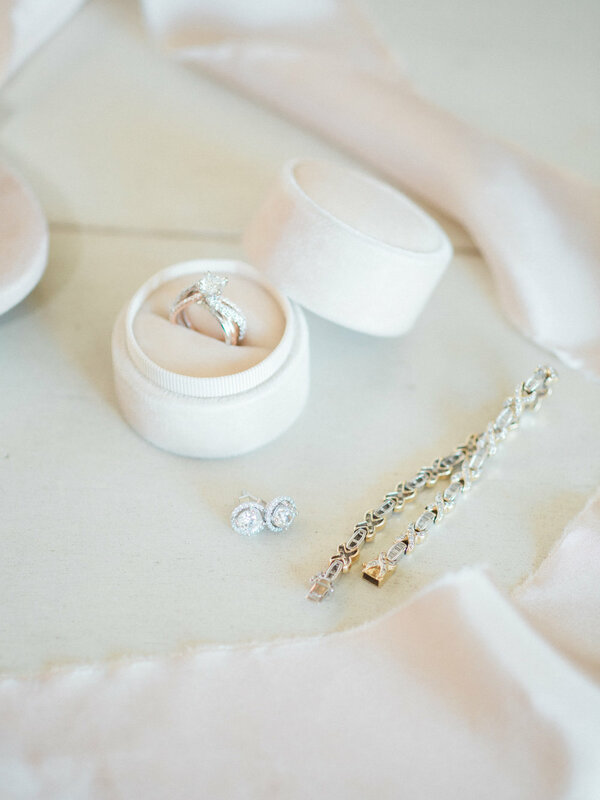 The bridal suite on site is just perfect for some classic detail shots. 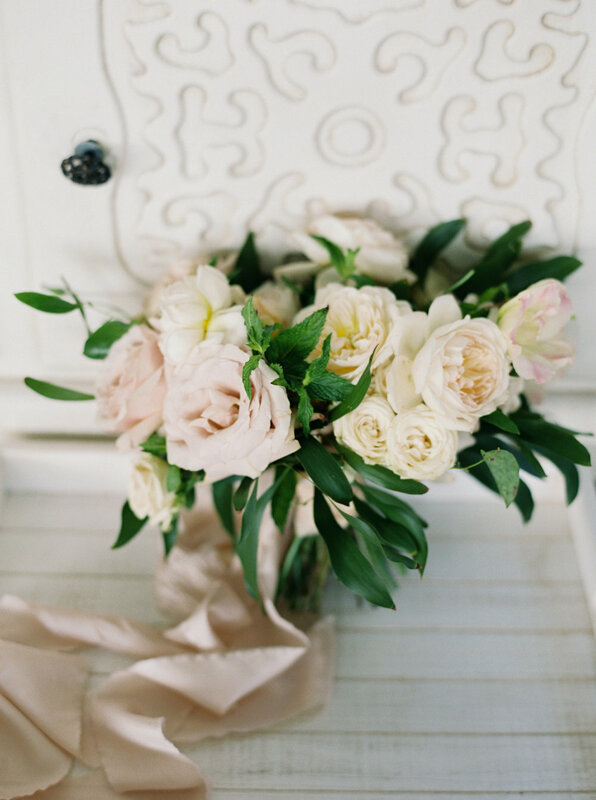 Colors don't have to pop to be noticed - soft blush tones were everywhere in this wedding and it oozed such a soft classic touch to the gorgeous event. The moments before the bride is all ready is so important - it is the time she shares with her closest friends and mentally prepares herself for the big day. We remind our brides to take a deep breathe and enjoy the process! Admire your dress, laugh with your friends and get ready to look fabulous! A trend that we think will never go out of style is mix-match bridesmaids dresses with the same color tone. In this case Jessica had her bridesmaids adorn blush gowns of different verity neckline but keeping it consistant with the long floor length gowns. A simple arbor decorated with accents of dahlias and roses pop without a hefty cost! 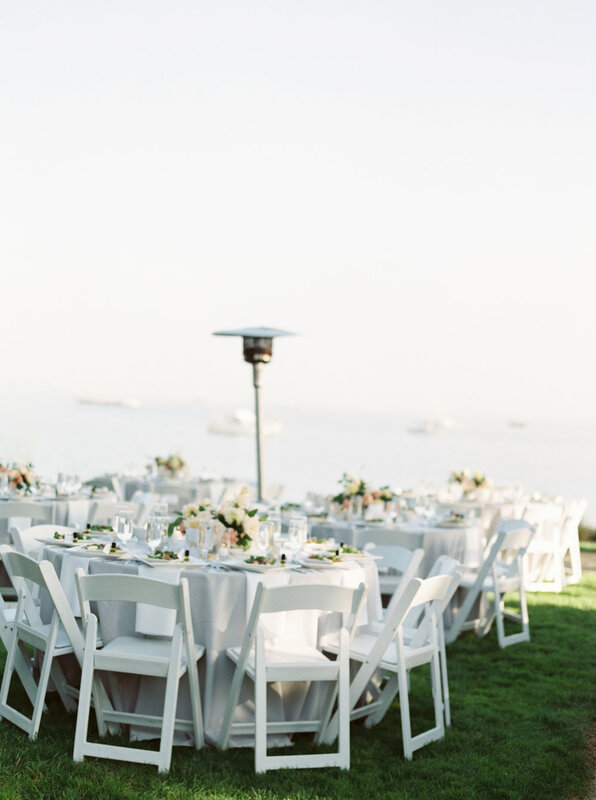 The white folding chairs on the patch of grass over looking the bay view gave such an intimate feel to the touching moment they became husband and wife. Jessica and Aaron as well as their guest enjoyed a cocktail hour on the patio as the staff flipped the ceremony area into a beautiful reception! 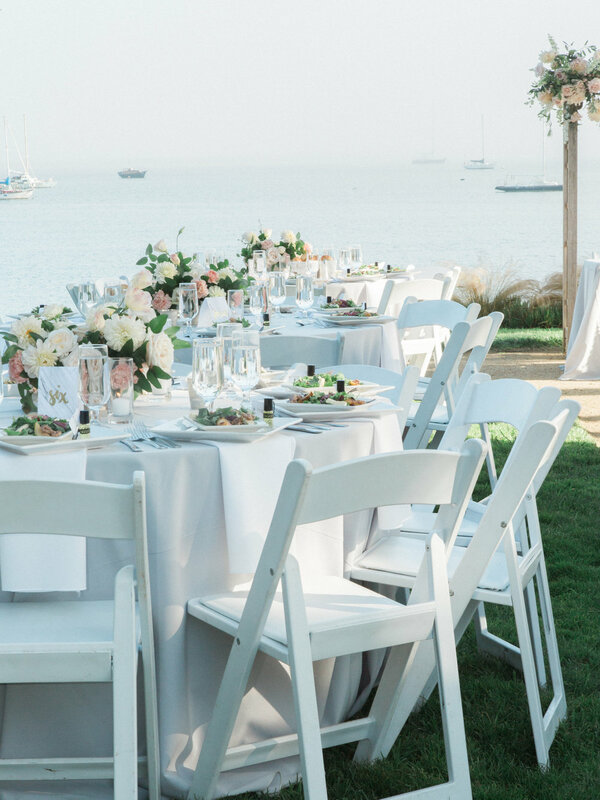 A great way to save by having the ceremony and reception in one place! There is always a way to make your space work for you. The same adorable white chairs, the muted blue tone linens with the blush pink roses and dahlias accented the soft table spaces so well! Movable heating lamps were brought out for the breeze and the arbor where they got married served as their back drop for their sweetheart table. Next to them their dessert table filled with delicious cupcakes and an adorable dripping cake. The music played through the air as the guests dined in the garden watching the sun set - it was rather a picture perfect scene if we don't say so ourselves! Jessica and Aaron came to us with an emphasis on making the day wonderful so that their guest can enjoy it with them. These two love birds just wanted good food, good music, and great atmosphere for their fun loving family! 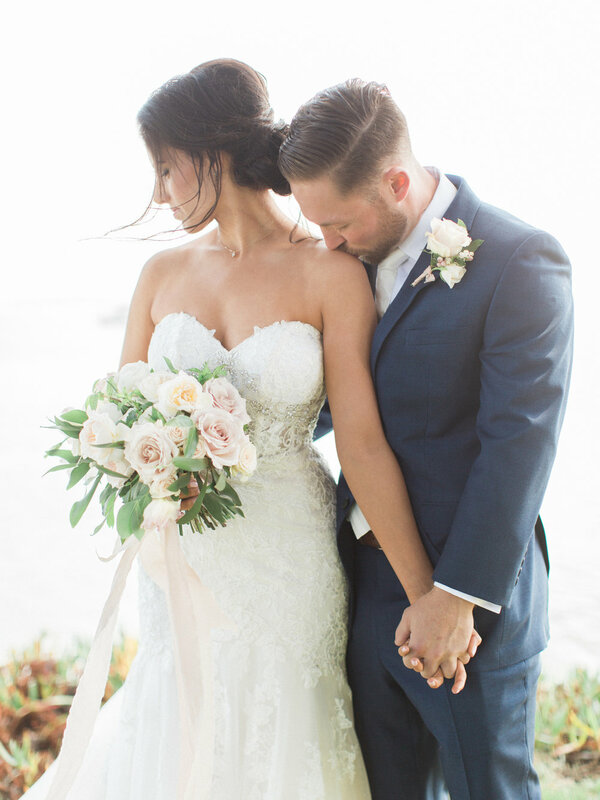 They wanted soft blush but understated, they wanted everyone to have fun and for a night their guests danced away in the secluded Half Moon Bay and we are so so happy for them both. Thank you for putting your trust in us and letting us style and create your special day - we wish you both the best of happiness!